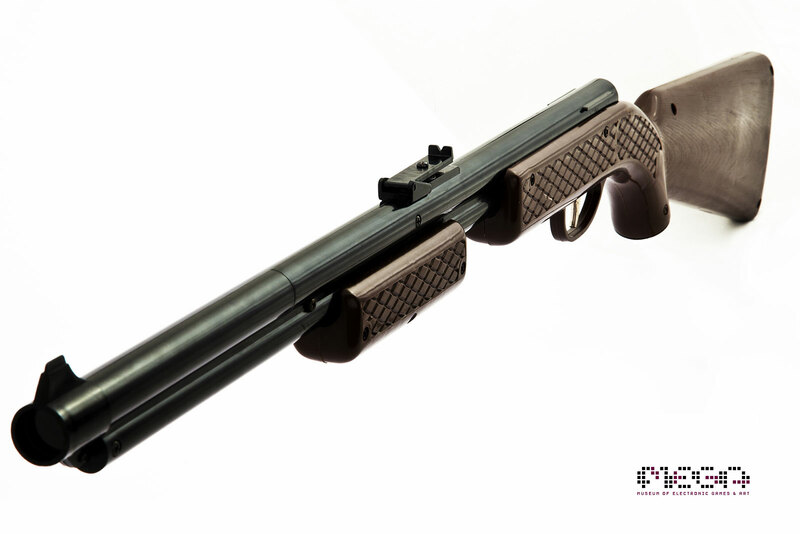 Remember how mind-blowing Super Mario Bros / Duck Hunt was back in the day? Two games on one cartridge. Like an old 45 record with the hit single on the “A” side and the weird throwaway track on the “B” side, Super Mario Bros was the blockbuster smash that everyone wanted to play, while Duck Hunt was the Zapper game where you shot scores of ducks while a dog laughed at your misfortune. I imagine the latter was the first multicart many of us had ever seen, but it wasn’t the first multicart to be released. The Wikipedia entry on Multicarts states that the concept – placing two or more games onto one cartridge – goes back to the Atari 2600 days. I don’t doubt the author – there’s plenty of unlicensed multicarts for just about every system – but they provided no links to verify their information, and my own “Atari 2600 multicart” Google searches only gave results from more contemporary multicarts like these. From what I can find, there were no officially licensed multicarts released for the Atari 2600 during the console’s heyday in the late 70s/early 80s, but I’d love to be proven wrong (politely, in the comments). Behold! The title screen for Hang On / Safari Hunt! 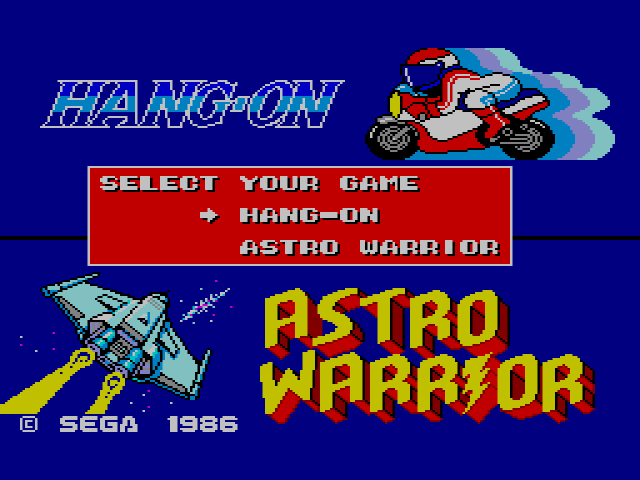 I’m not saying Sega’s Hang On / Astro Warrior and Hang On / Safari Hunt were the first two officially licensed multicarts when they showed up for the Master System in 1986, but they had to have been among the first. Mario / Duck Hunt was released in late 1988, while Hang On / Safari Hunt was released in America only sometime in 1986, both as a multicart and into the BIOS of some early Master Systems. Sega’s appeal to the masses: an arcade blockbuster and a game that took advantage of Sega’s gun peripheral, the Light Phaser. 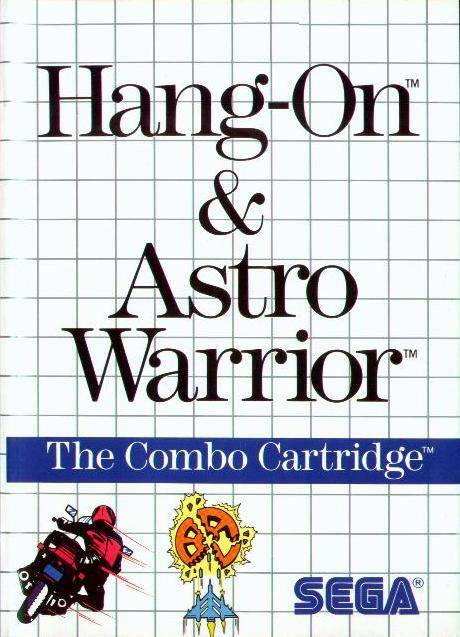 By comparison, Hang On / Astro Warrior is the more questionable pairing, as Astro Warrior didn’t take advantage of any Sega peripheral. Still, it’s the latter multicart that’s the “best buy,” if you will. By itself, Astro Warrior is a short, bland shoot-em-up in search of an identity. Paired with Hang On, the short bursts of shooter action complement the short bursts of motorcycle racing. Together, they almost make for one whole game. More visually striking, if nothing else. Neither Hang On nor Safari Hunt were released separately in America (Hang On was released separately for the Mark III in Japan, and released as a Sega Card in Europe in 1987 and again on cartridge in 1990), and I understand why. Hang On is a great racing game… in the arcade, using an actual sit-down motorcycle or a handlebar control. The Master System port, on the other hand, is adequate, but forgettable, thanks to the loose controls and sterile gameplay. 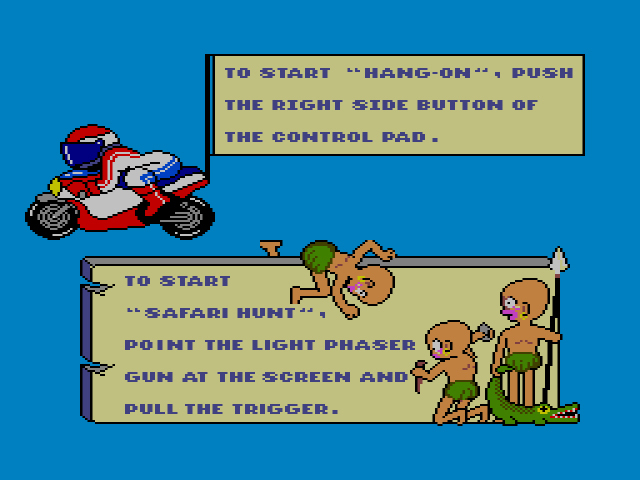 Safari Hunt puts the Light Phaser to questionable use, recalling Sega’s earlier Safari Hunting in both name and gameplay. While the latter had you capturing animals, Safari Hunt has you out on safari shooting animals – ducks, fish, armadillos (?!) – because what else are you gonna do with a Light Phaser? The game is fine for what it is, but Duck Hunt has more personality and the option to shoot clay targets if you feel weird about killing virtual animals. Unlike Super Mario Bros. / Duck Hunt, neither of Sega’s multicarts were worth writing about to your sweetheart. Hang On may have been Sega’s idea of a masterpiece or a breakout hit, but it certainly wasn’t the public’s. And while Safari Hunt and Astro Warrior were adequate side-games, what they really accomplished was showing the limitations of the early Master System game lineup as compared to the NES’s. Sega may have kick started the multicart in ’86, two years before Nintendo, but Nintendo did it best. Category: Arcade Games Master System SegaTagged: GamesHang-OnMaster SystemMulticartsNESNintendoRetroSegaSuper Mario Bros. I just going to prove you wrong here. I am actually selling one of my Xonox multicart games on ebay right now. What people are referring to are the the Xonox games. They made a number of officially liscensed double ended cartridges for the 2600. Now I would say is it really a multi cart? I don’t know. It’s more like two cartridges sharing the same printed circuit board and case that has a cartridge plug on both sides. You didn’t choose the game from a menu screen,you flipped the cart over to play the other game. But that was more of a mechanical issue, still had two games on one cart. Hang on / Safari Hunt was my first SMS game as it was packed in with my system. I know these days there is a lot of nostalgia with Duck Hunt what with Smash Bros and all. But Safari Hunt was a way better light gun game in my opinion. It was more fun for me than Duck Hunt which was rather simplistic. Not saying Safari Hunt wasn’t simplistic, but it was more engaging as light gun game for me. With different animals popping in and out of random places. It had some variety. But it did not have that snickering dog charm. But did have more variety in the levels and enemies. I knew there was proof that Atari put out multicarts! Thank you for this information. Uhhh… that Safari Hunt title screen. Yikes. I was thinking the same thing. But that was kind of par for the course for Japanese games depicting native cultures in the 80’s. At least they weren’t drawn in black face. It still counts as blackface even if someone lightened their skin. I’d be curious to see the original Japanese title screen. According to the CW, that Wonderboy image is A-OK (their airings of Dragon Ball Kai altered Mr. Popo to have that exact same blue hue). I remember discovering this (the Hang On/Safari Hunt combo) by accident after I picked up an SMS at a garage sale when I was a teenager. I didn’t know it had any built-in games, but one time I started it without inserting the cartridge properly and was greeted by that start-up screen. It was a nice surprise — the system came with just four or five cartridges so this was a significant addition to the library of games I had — but neither game held my attention for long. Safari Hunt was my intro to “light gun games that aren’t Duck Hunt,” and I was mildly impressed by the variety of critters. Hang On is what it is — simple arcade action and nothing more. I think I’d rather have this than what was included with the NES at its launch, at least in terms of gameplay value — sorry, R.O.B. — but obviously it pales in comparison with the SMB/DH multicart. While I personally feel that Gyromite is an underrated two-player game, trying to play it with ROB is beyond infuriating. 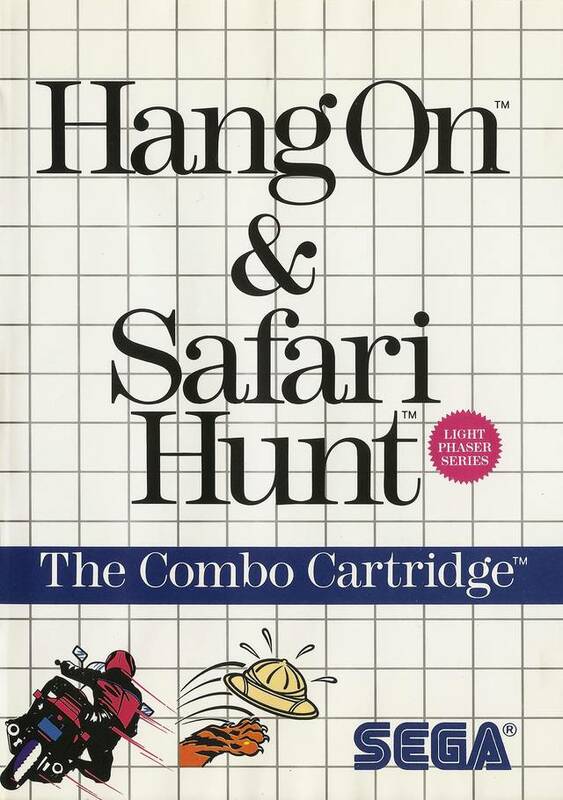 Gyromite and Duck Hunt at the original NES launch versus Hang On/ Safari Hunt… not an easy choice to make. Sorry I have these moments. The mid-80s were slightly gentler times, to be sure. Still, neither the Zapper nor the Phaser holds a candle to this beast.